iRoc is no longer available, and does not run on iOS 9 or higher. Rocweb is the successor of iRoc. iRoc is the ultimate wireless Rocrail controller for iPhone and iPod Touch. iRoc connects to the client port of the Rocrail server. User interface is localized; Depending of the language selected for the iPhone. This App you must buy but the maintenance and further development is free and therefor this Popup will remind you about that. Select Settings on the iPhone and then iRoc. Allow the iPod to go to sleep while iRoc is running. After a wake up iRoc has to be started again because it will quit at sleep. The last selected Loco is shown and can be edited in the settings. It will be overwritten at application end. The default behavior of the slider is to send velocity changes only if is released. Set High Sensitive to on to send continuos velocity changes. Fine tuning of this behavior can be done by setting the Velocity Delta to another value; Default is 4 which means that only a velocity change is send if the slider position has moved at least by 4. Click on the Loco ID field to select a loco. Depending on the setup a numerical key pad for entering an address or the loco list is offered to chose from. The loco list is provided by the Rocrail server and is part of the current active layout. Selecting a Loco from the list. Touch the loco field to open the list. Scroll through the list and touch the wanted loco. If the Rocrail server is configured with "Disable steal loco control" you have to release the loco before another iRoc client can take over control. Loco Select a loco from list. Direction Change running direction of selected loco. Direction Release the current selected loco from this iRoc throttle. The navigation bar at the Loco throttle page provides a button for controlling the selected loco in automatic mode. If no schedule or block is selected in the picker this will send a plain "Go" command to the selected loco, make sure the Rocrail server has set the auto mode on. Extra control information is send if a block or schedule is selected before the Start button is pressed. If the loco should be controlled in half automatic mode this option must be set before the start command is send. The schedule and block picker selections are ignored and reset to "none". The selected block from the picker is set as current block for the selected loco. If the button has the light on it means that the selected loco is swapped. The button action send to Rocrail a swap command with a placing flag. To get it working the way iRoc shows a Rocrail server revision 1055+ is needed. With older revisions the iRoc button state could be not corresponding to the real placing. In the loco settings you can dispatch the selected loco to a Fred. 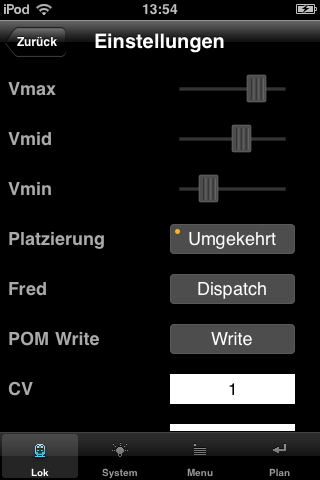 In the loco settings you can program the CV - value pair. If touching an item, like switch or signal or sensor, the background will turn yellow and a command is send to the Rocrail server. The graphical representation of the item is changed, according the new state, after receiving a broadcast from the Rocrail server.